From the dramatic set, resplendent in strobe and laser lights, to the black lacquered stage that made the Top Two look like they were gliding on water, Carnival City’s Big Top Arena was the perfect setting for tonight’s final showdown. Facing off was Paxton Fielies, 17, from Bishop Lavis in the Western Cape, against Mthokozisi Ndaba, 25, from KwaMashu in KwaZulu-Natal. After months of battling it out in a bruising contest that started with thousands of hopefuls, Paxton and Mthokozisi showed the country just why they were the last two standing. 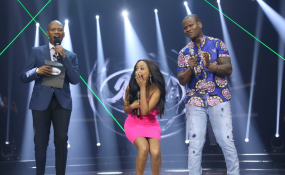 But before the nail-biting announcement of the Season 13 winner, Idols SA put on a dazzling showcase of homegrown talent that saw the stage feature one formidable act after the other. This season’s Top 10 opened the two-hour display of showmanship with a high-octane performance of, 'Four Five Seconds' by Rihanna, Kanye West and Paul McCartney. The pageantry continued with special medleys and mixes featuring DJ Tira & Destruction Boys, Tipcee, Naak MusiQ, Madness, Season 12 winner Noma, Judge Somizi and Heavy K, Kwesta, TLT, ChianoSky, and KidX. Season 13 vocal coach, Donald also gave the audience and viewers a taste of his Red Mic Experience when he took to the stage to perform 'Landela', featuring the Top 10. It was a magnificent display. There was also a touch of nostalgia courtesy of Boom Shaka and TKZee, who performed a medley of their cool kwaito hits that had the full-capacity audience on their feet. This was also the season of record breaking votes, with 98 million votes recorded for Season 13, while a staggering 30 million-plus votes were cast in the last week for the Top Two. Paxton and Mthokozisi were not stingy with their golden voices either tonight. Accompanied by the multi award-winning Soweto Gospel Choir, Paxton performed 'Stand Up for Love' by Destiny’s Child and Mthokozisi sang R. Kelly’s The Storm Is Over. They also collaborated on a remix of 'Back To The Beach' by Kyle Deutsch and Shekinah. It was a fitting swan song for the two as they stood together on the Idols stage for the last time before Paxton was crowned the winner of Idols SA Season 13!